Someone kidnapped Blue Bot's beloved Pink Bot! Blue Bot can't stay silent, doing nothing! He will find her and try to save her! 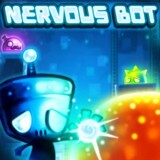 Complete each level to get Blue Bot closer to his loved one. Be careful! Levels have rules, and you can't win if you break them! Have fun!